Now with our NEW spinner fly, our regular style swooper flag will not fly off the pole. The spinner fly secures the flag to the pole via the convenient string on the bottom of the flag. It also spins 360 degrees so that the flag never gets tangled around the pole. Very easily installed with a screw driver. Spinner Fly is only needed for the regular style swooper flag. Our N.A.I. 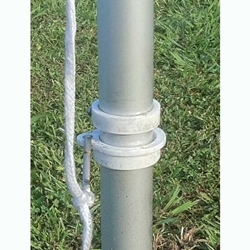 style swoopers do not have a problem with flying off the pole, because they bend all the way parallel with the ground.